What do you get when you combine a winter parka, snow covered trees and a silent night? Our first escape sans kids, to the Woods Parka Lodge. Ok, so maybe the night wasn’t so silent. Anyone with kids knows that you can’t escape them. Even during a night away you’re still talking about them and thinking about them and waking every hour to worry you’ve forgot them somewhere or because you hear a phantom cry. Or, is that just me? 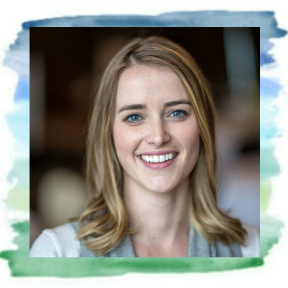 I recently read an article from Scary Mommy (article found here) about the impact of a second child on a mom’s mental health. I knew going from one to two would be a challenge, but I really didn’t know to what extent. We are so fortunate to have these little gals and my heart is filled with nothing but love for them, but it’s flippin’ hard. Rewarding, but hard. I constantly feel like I’m being pulled in multiple directions with no time to sit down and take a breath. Some days, I feel like I don’t know myself anymore. I’ll admit, some days, I just need a break. And so, that’s exactly what we did. And one of the best ways we know how - outdoors. At only 5 months old and 3 years old, we were a bit hesitant to leave the girls for the first time. Miss B has yet to sleep through the night. But, knew they were in good hands. 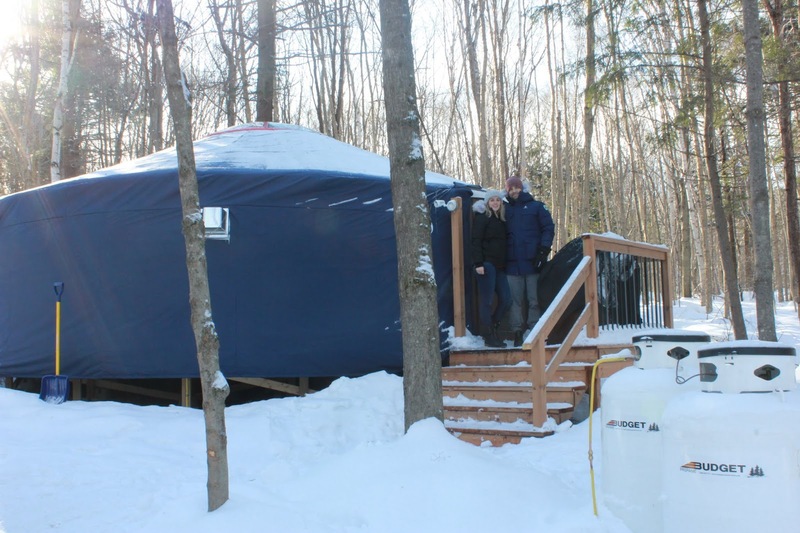 We also knew we couldn’t pass up the opportunity to sleep in Canada’s first (and only) parka-insulated winter yurt. Yes, you read that right. 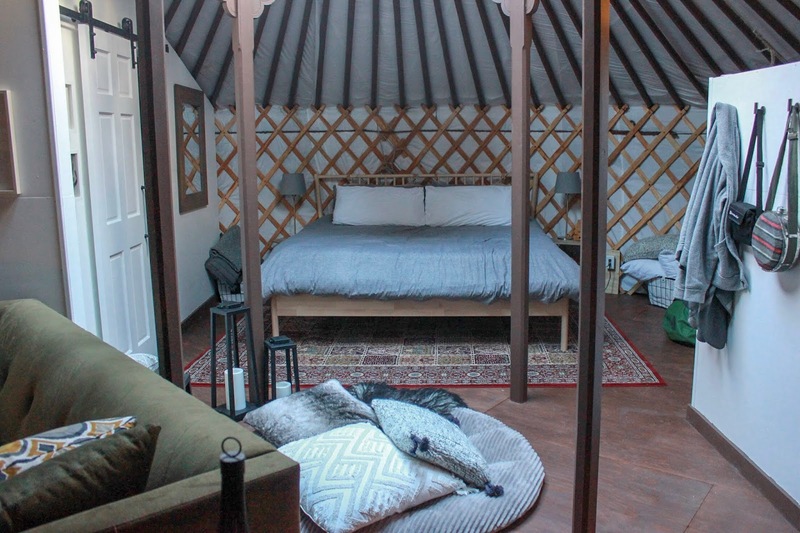 A yurt. 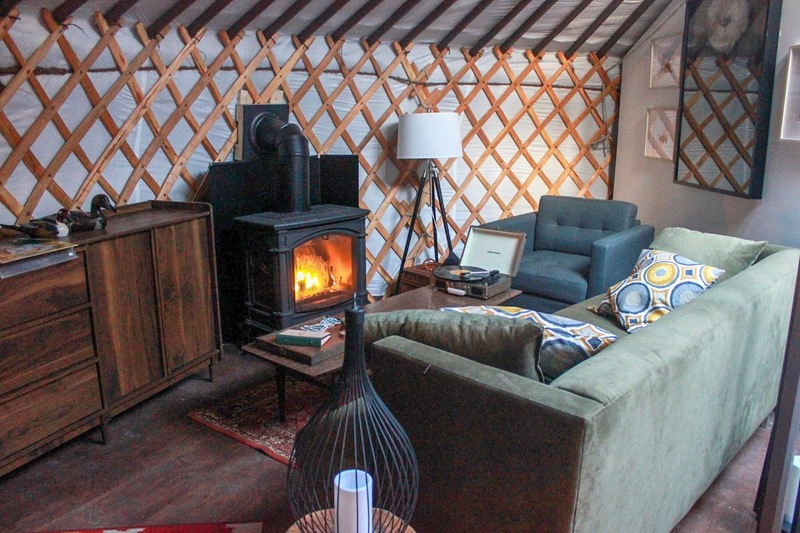 Or as it better described, glamping on steroids. 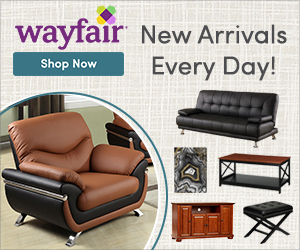 Before we get started, I should mention that this is not a sponsored post. 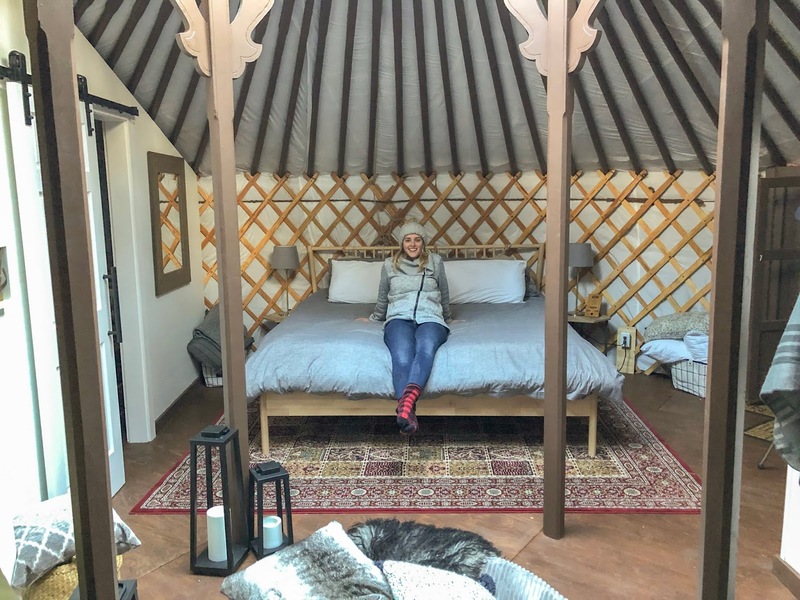 After seeing the yurt on a fellow blogger’s Instagram, I knew we had to go. The trip was booked and paid for through with money from our own pockets. 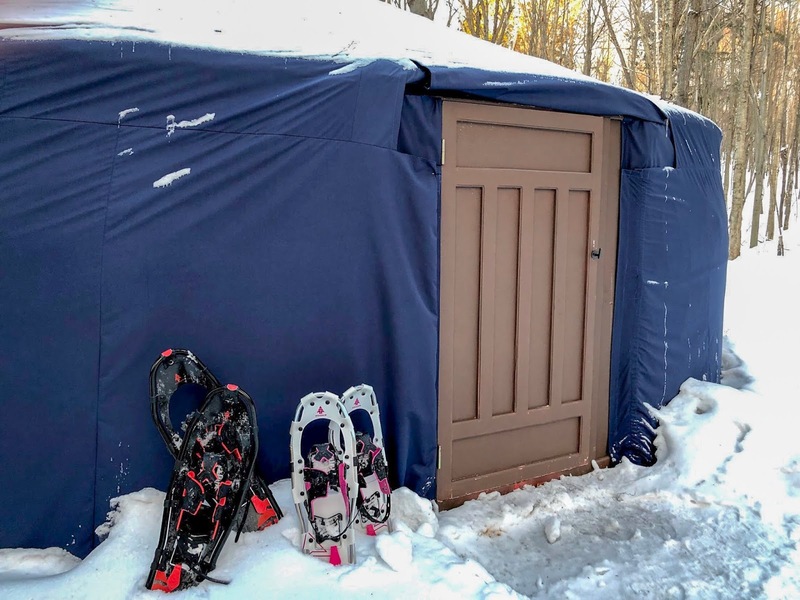 So what exactly is the Woods Parka Lodge? A pretty clever marketing campaign. 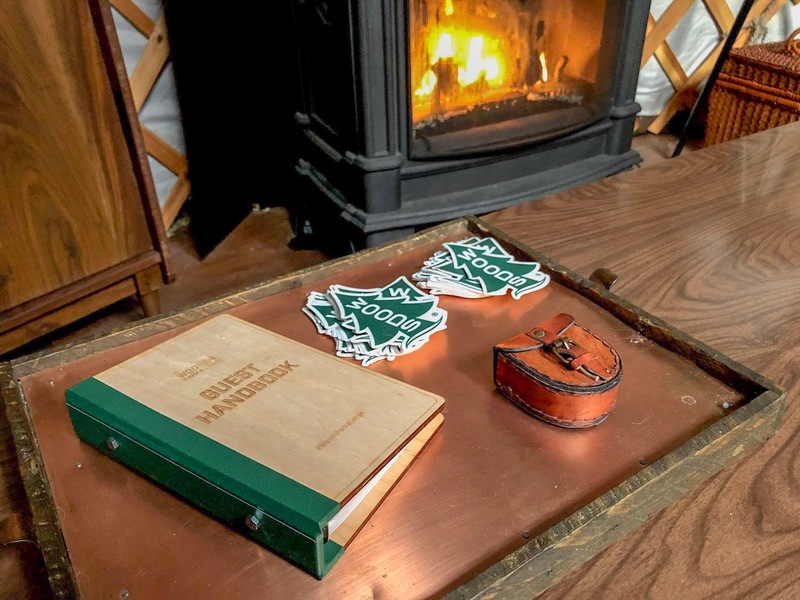 The outdoor lifestyle brand Woods took an adventurous approach when launching its latest winter-wear collection, working with retailer SportChek and Airbnb to create the Woods Parka Lodge – a winterized yurt “designed for modern day explorers with an eye for style” – with the goal being to highlight Woods’ 133 year history in Canada. 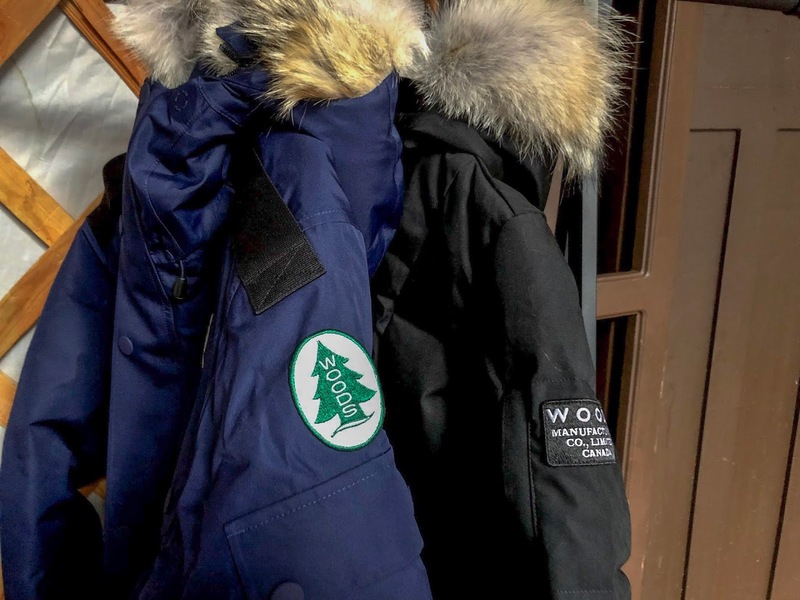 As part of the activation, lodge-goers are also given a new Woods’ Alverstone Expedition Parka or McBride Bomber Jacket and have access to the surrounding 60 acres of forest land to test out its warmth. Steve opted for the Alverstone in navy and I chose the McBride Bomber in black. 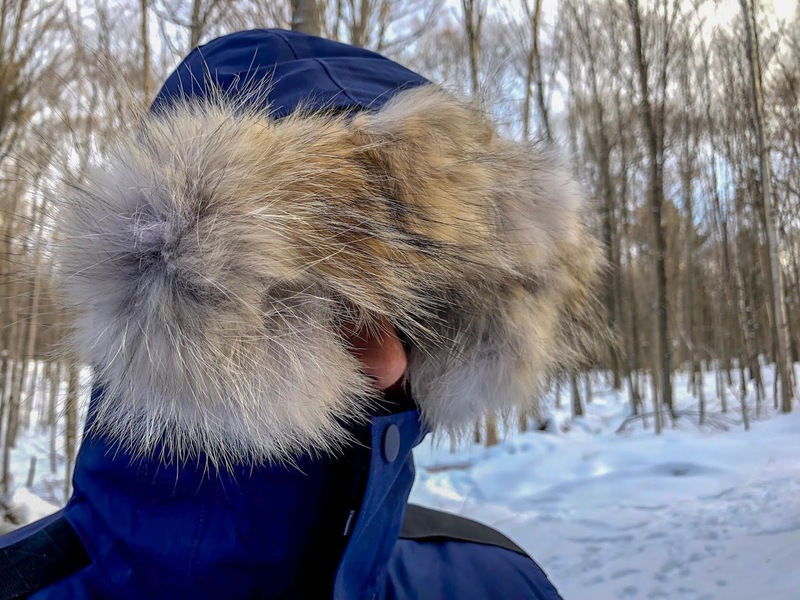 And with temperatures dipping to -18C when we were out exploring, the jackets were definitely appreciated. We made the three hour drive up to the Haliburton area on a clear Thursday afternoon. Half way through the drive, the landscape began to change. The flat snowless ground turned to snow covered hills. It was a winter wonderland. When we finally made it to the yurt, we knew we were in for something truly special and unique. 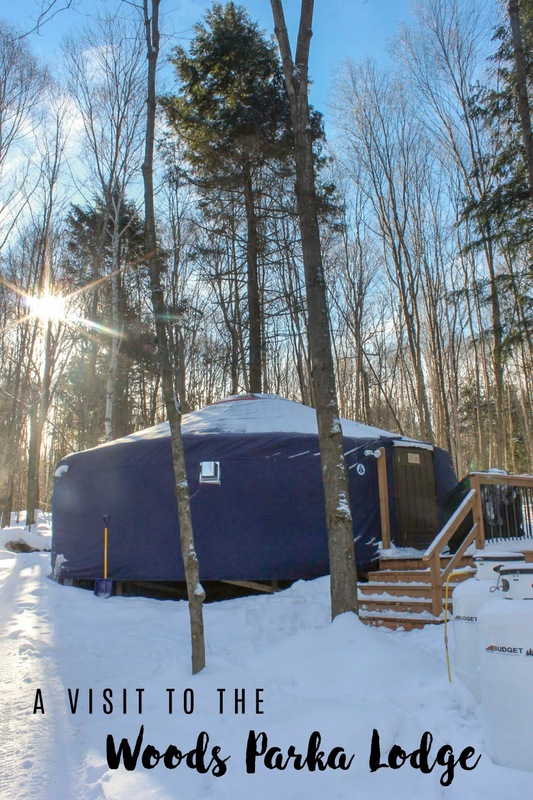 At first glance, the yurt looked small. But as we opened the door, we were instantly transported into our cosy and classic abode for the night. 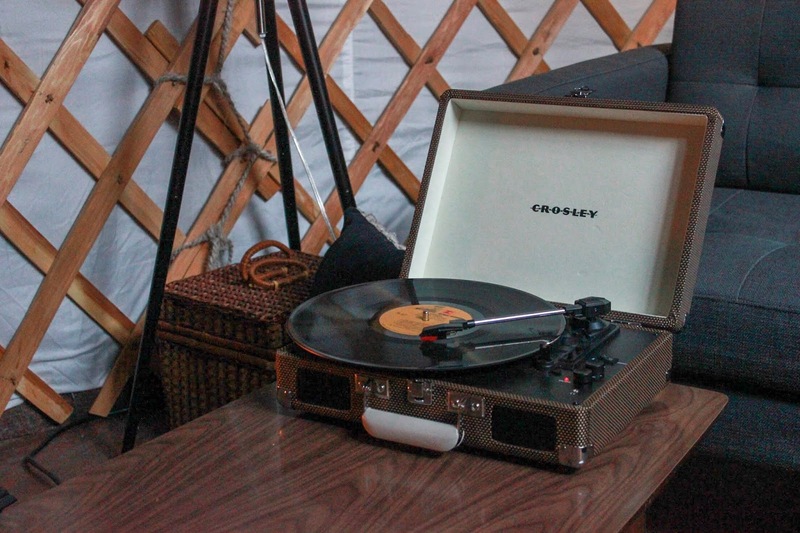 We explored the yurt, taking in all of the small touches - the Crosley record player, the boards games, the pieces of Woods history hanging on the wall and so on. 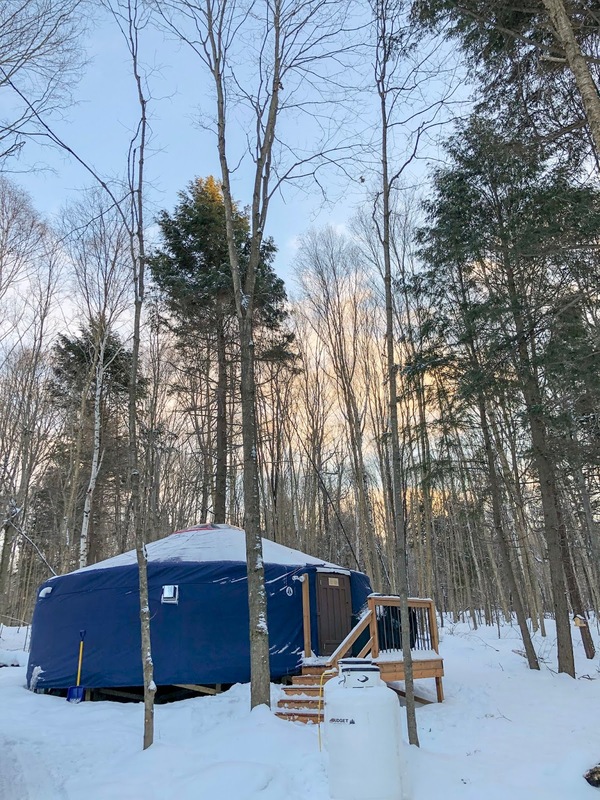 While it was still light outside, we decided to don our new winter jackets and snowshoes and explore the acres of wooded forest behind the yurt. 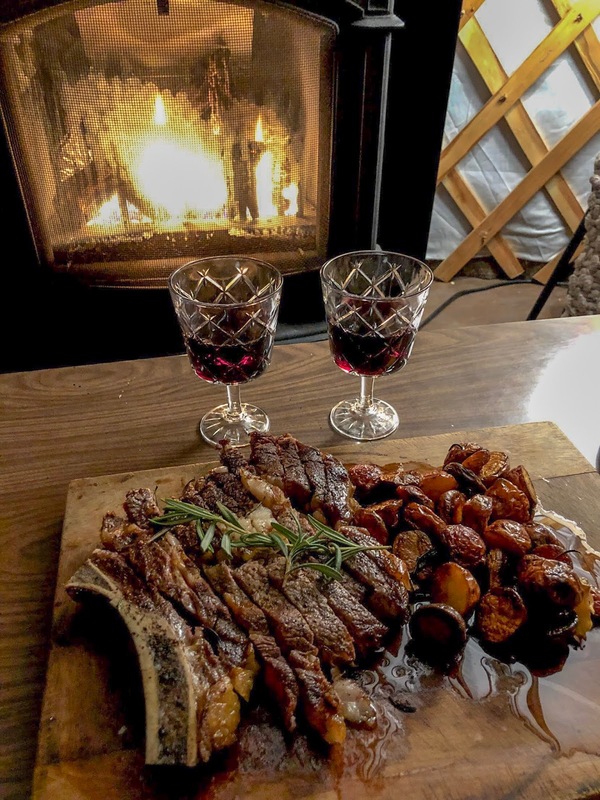 For dinner, we took advantage of the outdoor grill and treated ourselves to steak, potatoes and a glass of red wine (or two) in front of the indoor fireplace. It was a celebration after all. As the sun went down, the skylight in the center of the yurt gave us a glimpse a life without light pollution. The stars were amazing. The temperature outside when we tried to view them, not so much. A chilly -23 degrees C over night isn’t for everyone. Thank goodness for the roaring indoor fireplace, a comfy Endy mattress and pillow and a heavy duvet. 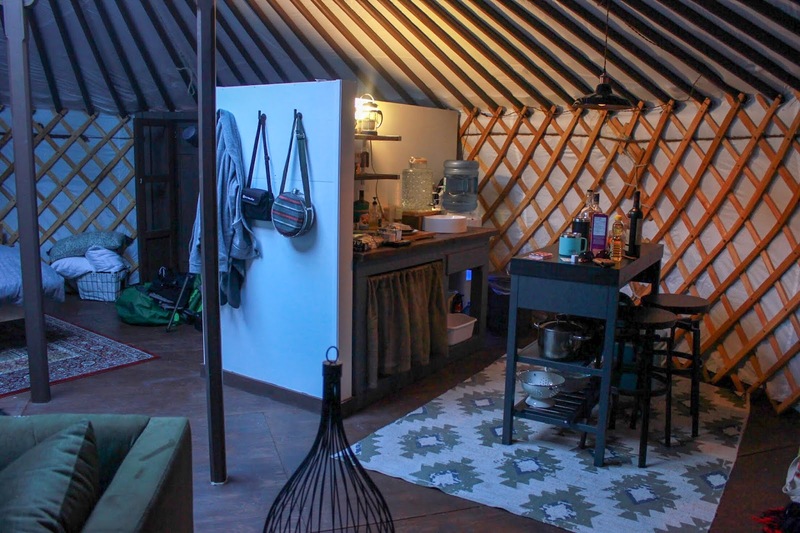 Without the yelling and screaming of a toddler and baby, it was eerily quiet in the yurt. Our heads hit the pillow around 10:00am, but not without a few texts to Gramma and Poppa to make sure the girls were ok. All was good on the home front. Now, we could sleep. Or not. We were both awake a few times throughout the night. You know, those phantom cries I mentioned before? While we may not have that great sleep we had dreamed of, one thing that was different was that we were able to stay in bed… until 10am. I forgot what it was like to sleep in. And just like that, our time was up at the Woods Parks Lodge, and it was time to head back to the girls. It was the perfect escape to refresh, recharge and reconnect since becoming a family of four. Just what this mama needed. It’s crazy was a bit of fresh air can do for your mental health. How do you recharge? I’d love to hear! Rhubarb offers special features each evening in addition to the new all day menu which showcases local seasonal food. Upscale casual dining in cottage country located on the shores of Mirror Lake in picturesque Haliburton County. Boshkung is a small batch brewery focused on cottage living, local fare and great tasting beer. Their core beers (available year round) are a Cream Ale, Kellerbier and English Style IPA. For over 80 years, Kawartha Dairy has been proud to be a 100% Canadian-owned company, still operated by the same family that started it back in the beginning. They sell ice cream, milk, butter, cream, egg nog, ice cream cakes and more. 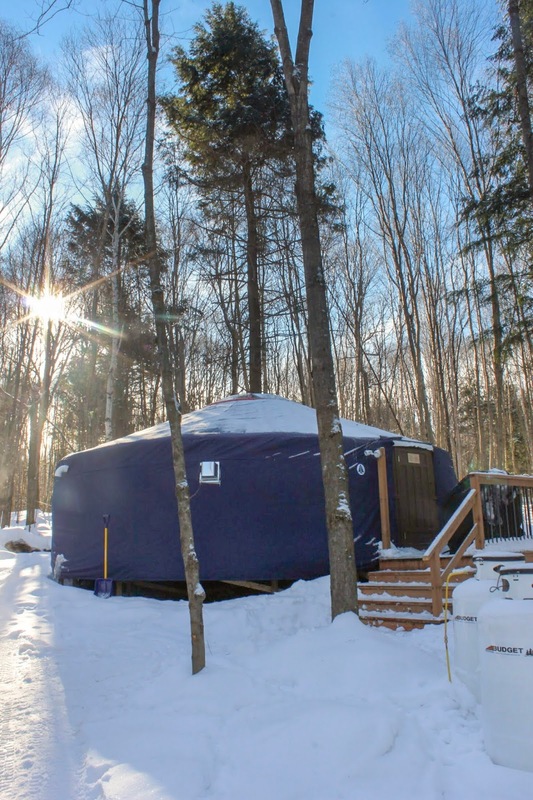 Haliburton Forest is an outdoor lover’s paradise and a wood lover’s dream. It is a research facility and an education centre. It is a property where members of our community make their livelihoods, and thousands of visitors make their day. Haliburton Forest is 100,000 acres, 100 lakes, and millions of trees, and it is home to countless creatures. Above all, and always, it is a sustainably managed forest. The Wolf Centre is a 5,000 square foot facility that houses exhibits, a cinema and classroom and a large indoor observatory to catch a glimpse of the members of the Forest’s wolf pack, permanent residents since 1993. With live wolfcams and wolf exhibits, you can almost always catch a glimpse of our wolves as they wander through their 15 acre forested environment.